Before I get going… how ’bout that pic? That’s Baye Moussa Keita on the left… from Senegal, West Africa. Think he’s fired up by Dion Waiters? Holy crap. That’s an intense Kevin-Garnett-esque face. Back to the Orange. What planet am I living on? Syracuse is no. 1 in the AP poll. After losses from Kentucky and a Sullinger-less Ohio State, that’s not shocking. But this… this is shocking. This has be an incorrect stat, right? It’s the fourth time they’ve topped the poll and the first time since a one-week appearance late in 2009-10. Syracuse was No. 1 in the 1987-88 preseason poll and for six weeks in 1989-90. Serious? The fourth time? Like, ever? Historically, when I think of Syracuse basketball, I think of them right up there behind Duke, North Carolina, Kentucky, Kansas and UCLA. In no particular order. That’s accurate, right? So, 4 times? That’s it? That’s weird to me. What’s not weird to me? This pic of Boeheim that Caster sent me. So pimp. Proud of Boeheim for facing the music after making idiotic comments in response to the Bernie Fine allegations. Big props to Boeheim for getting his team ready to play every day in the midst of the chaos surrounding them. He’s making his players look like superheroes. This entry was posted in Basketball, NCAABB and tagged Baye Moussa Keita, bernie fine, Dion Waiters, jim boeheim, NCAA, no. 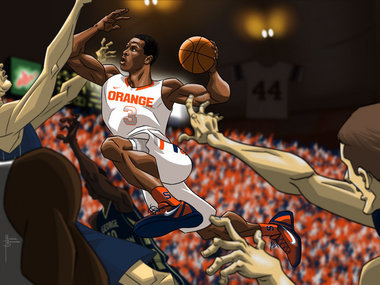 1 AP poll, Syracuse, Syracuse Orange. Bookmark the permalink.